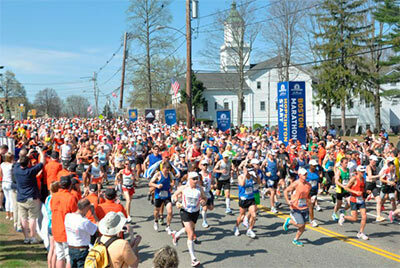 Did you know that the worlds oldest annual marathon is in Boston? Dating back to 1897, the Boston Marathon is the world’s oldest annual marathon and New England’s most widely viewed sporting event, attracting as many as 500,000 spectators each year. Dating back to 1897, the Boston Marathon is the world’s oldest annual marathon and New England’s most widely viewed sporting event, attracting as many as 500,000 spectators each year. This prestigious road race is traditionally held in the historic city of Boston on Patriot’s Day, the third Monday of April, which is often locally referred to as “Marathon Monday.” Known for attracting some of the fastest runners from around the world, it’s one of six World Marathon Majors events and the only marathon in the country to require that entrants meet specific qualifying times. The marathon route is a point to point course that starts on Main Street in Hopkinton and runs 26.2 miles through eight cities and towns, passing by numerous Boston area hotels and attractions, such as Ashland State Park and the birthplace of John F. Kennedy, now a national historic site. The finish line is located on Boylston Street in front of the Boston Public Library at Copley Square in downtown Boston. The full route is closed to traffic at midnight before the race, providing a great opportunity for early-birds to enjoy some sightseeing in Boston, either on foot or by bike, prior to the start of the event.